The very name Kurosawa Akira carries with it some pretty heavy cinematic baggage, with any work that does not meet the criteria for classic unfavourably compared to those that do, films that to this day are amongst cinema's greatest achievements. His 1950 Scandal [Shubun] is doubly cursed in this respect. Regarded by a fair number (though by no means all) of those who have seen it as a minor Kurosawa effort, it was also made and released shortly before Rashomon, a genuine movie masterpiece that brought the director and Japanese cinema to world attention. This very proximity makes it hard for any follower of Japanese cinema to judge the film purely on its own merits, but I'm prepared to give it a go. The story revolves around painter Ichiro Aoye and singer Miyako Saijo, who after a chance meeting end up at the same hotel. Here they are tracked down by two paparazzi photographers, who snap the couple in a perfectly innocent encounter, an image that quickly appears in the celebrity gossip magazine Amour as evidence of an illicit affair. The story is given extra spice when Aoye drops in to the Amour offices and gives publisher Hori a physical seeing to. Enter low-rent lawyer Hiruta, who convinces Aoye that they should take the case to court, but it turns out that Hiruta's legal integrity is not all it should be. The first and most obvious thing that strikes you about Scandal, given the year in which it was made, is how contemporary its story has remained – it's easy to see parallels with the activities of modern tabloids and the general public's seemingly insatiable appetite for celebrity gossip. This also represents one of the film's key problems, as we are asked to identify not with ordinary people whose lives have been destroyed by spiteful lies, but a well-to-do singer and a self-confident and resilient painter, both successful in their respective professions and who suffer little more than bad words as a result of the story, and certainly never face anything approaching real hardship. The dramatic upshot of this is that the stakes are not that high, and by the time the case gets to court there is little real tension, as the pair appear to have little to lose if things do not go their way. It all becomes a matter of moral right against wrong, which is certainly enough to engage, but not to compel. This is partly due to the broad and largely uncomplicated strokes with which the characters are drawn: Aoye and Saiji are upright, blameless and utterly decent; Amour editor Hori is sleazily self-confident and completely without scruples; and lawyer Hiruta is a maudlin drunk with a gambling addiction and a tubercular daughter, whose smiling, starry-eyed innocence is enough to instantly beguile Aoye and even prompt her sloshed father to blurt out his misdeeds before falling instantly into a snoring sleep. With such clear-cut examples of the good, the bad, the tragic, and the redemptive, it's hardly surprising that the story plays out in largely melodramatic fashion, at times slipping quite spectacularly into sentimentality. Curiously, this appears driven more by Kurosawa's experience of the Hollywood product than by traditional Japanese cinema, as Christmas arrives and the sounds of Jingle Bells, Silent Night and (huh?) Buttons and Bows wash over the soundtrack and an entire bar get chummy and dewy-eyed singing Auld Lang Syne in what comes across as a mushy version of Casablanca's rousing Marseilles sequence. Of course this also reflects a post-war Japan that has lost part of its cultural identity and moral strength following the American occupation, with even the name of the offending magazine a French word widely used in the West rather than Japanese in origin. Elsewhere, however, there is a great deal to admire and enjoy. 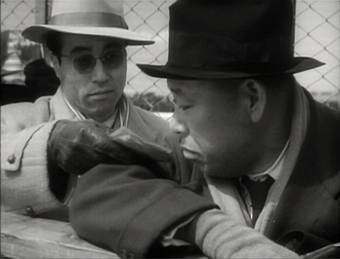 If the casting of Kurosawa's favourite leading man Mifune Toshiro as Aoye creates a character who appears more warrior than painter, with a motorcycle as his steed and a 'punch first ask questions later' attitude to publisher Hori, then this is balanced through the use of the director's other main man Shimura Takashi as Hiruta. 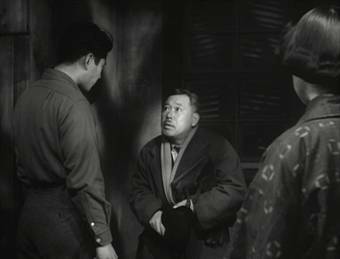 Hunched up and crushed by the weight of his own failings, his moment of arrival in the film is a gem, as he follows his wind-blown hat into the Aoye house after scaring the posing Sumie, pauses to look up at the artist like a confused bullfrog, then hands Aoye his card and scuttles over to the stove to dry out his socks, explaining his purpose in engagingly disjointed manner as he does so. If his drop into relentless self-pity in the film's midsection is a bit much at times, then the scenes at the race track and the courtroom climax still allow the actor to show his metal. His legal opposition displays an equally intriguing casting differential, with Ozawa Eitrô's villainous sneering as Hori eclipsed by Aoyama Sugisaku's imposingly officious authority as top prosecuting lawyer Dr. Kataoka. Individual scenes are particularly memorable, as when the very drunk Aoye and Hiruta stumble around each other on their way home or Aoye transports a Christmas tree on the back of his bike. The farmers called to testify at the trial deliver the film's rare moments of comedy, while Aoye's relationship with his long-time model Sumie provide the film with its most intriguing character detail, their easy but open banter reminding me almost of Claudius's unfussy attachment to the prostitute Calpurnia in I Claudius – Aoye and Sumie may not be sleeping with each other, but there is clearly a bond between them that over the years has gone beyond that of artist and model. That this is never built on is simultaneously a little disappointing and yet pleasingly ambiguous. Probably the key pleasure for film fans, though, comes from Kurosawa's repeatedly inventive and telling camera placement and sometimes superb editing, the sheer breeziness of the pace of the opening scenes getting the main plot up and running in a matter of minutes, and the action is propelled from scene to scene with sometimes inventive economy. If there is a little too much reliance on newspaper headlines to explain key plot developments in the later stages, then this also keeps the pace kicking over, right up to the inevitable but still pleasingly handled outing of the truth. The biggest surprise about the whole venture is the vitriol with which Kurosawa, through the mouths of his characters, attacks Hori and by association the yellow press he represents. The venom expressed by Hiruta in his lowest moments is simply out of proportion for the deed in question and makes you wonder just what incident in Kurosawa's own past – what tabloid attack on his own work or person – pissed him off so much. One last thing – if you've seen the film, don't you just ache to see Aoye's much discussed picture of the red mountains? OK, before we even kick off here a couple of things need noting. The film itself had not been well preserved and both the picture and soundtrack had suffered considerable damage, which have undergone extensive restoration by Eureka, but a number defects do remain. In addition, Scandal was one of several Japanese films made in the immediate post-war period in which the dialogue was post-dubbed, and not with the sort of pin precision that is possible now, resulting in some very noticeable synchronisation issues. Given all this, the picture restoration is very impressive, with detail levels and contrast generally very pleasing, and although some damage remains it rarely detracts from the viewing experience. The framing, as you'd expect, is 1.33:1. The mono 1.0 soundtrack fares less well, with pops and crackle proving fairly constant companions, though the dialogue and music are clear enough. The above-mention sync issues will not prove a major problem for non-Japanese speakers, who will be flitting between faces and subtitles, which are well translated, if not always bang-accurate. A video Introduction (6:39) sees Alex Cox having a bit of a dig at Kurosawa over his attitude to the film's subject matter, revealing a little about the director's relationship with the popular press and wondering just what he had to hide. Compression artefacts run a bit wild here. The Gallery has 25 of Shochiku's original promotional stills and the poster, all of which are in very nice condition and reproduced at a decent size. Finally there is the expected Masters of Cinema Booklet, though it's a little thinner and with larger type than usual, containing just one glowing essay by Joan Mellen, which is a very interesting read. How you react to Scandal will be governed in part by your tolerance for the sentimental and your views on the tabloid treatment of celebrity lives. And yes, it does pale somewhat when compared to the same year's Rashomon (there, I said it), though both films are ultimately concerned with the nature of truth and how it can be manipulated for personal ends. All other considerations aside, the film is still well worth seeing for its technical handling and Shimura's performance, and is still a must for anyone seriously interested in the work of one of the world's finest directors. Eureka have done as good a job as can be expected given the condition of the original materials, and in terms of the picture quality have actually exceeded expectations. Frankly it's great to see less widely heralded films receiving the Masters of Cinema treatment, and on that score alone this release deserves to be applauded.